The records of Longhouse, Publishers and Booksellers of Guilford, Vermont are now available for research. Poet and editor Bob Arnold established Longhouse in 1971 and was joined by Susan Arnold in 1974. Specializing in poetry, they have published hundreds of folders, chapbooks, broadsides, anthologies and small edition books by mimeograph, letterpress, photocopy and off-set. Several noted writers have worked with Longhouse over its more than forty years of operation, including Cid Corman, David Giannini, Lyle Glazier, Ted Enslin, Janine Pommy Vega, Louise Landes Levi, Charlie Mehrhoff, Hayden Carruth, and John Levy. The correspondence from Corman, Enslin, Levasseur, and Giannini is particularly voluminous and is valuable for understanding the rewards and challenges of the life of a poet. 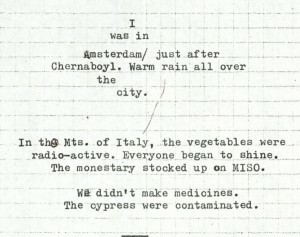 The following excerpt from a December 31, 1983 letter from Cid Corman to Bob Arnold is an excellent illustration of a noted poet detailing his need to create poetry, the struggles of getting work published, his financial picture, and his overall state of mind all in just a few short paragraphs. Of course – the bulk of my work remains unpublished. Here too – various people write me with apparent desire to help – but nothing comes of it. Jonathan Greene has ts. For a selected haiku volume (translations) for the coming year. The Kusano book and Station Hill Press volume are both well overdue – as usual. And ORIGIN no. 2 – Terry tells me – was to have gone to press on the 19th. I lose track of the books that publishers have long since accepted and have let sit interminably: I assume they are waiting for me to die. The collection is also a great source for looking at the process of making poems. Poets shared their work in progress with Bob Arnold in their correspondence, and the manuscripts section of the collection shows works as they go through the various stages of the publishing process. 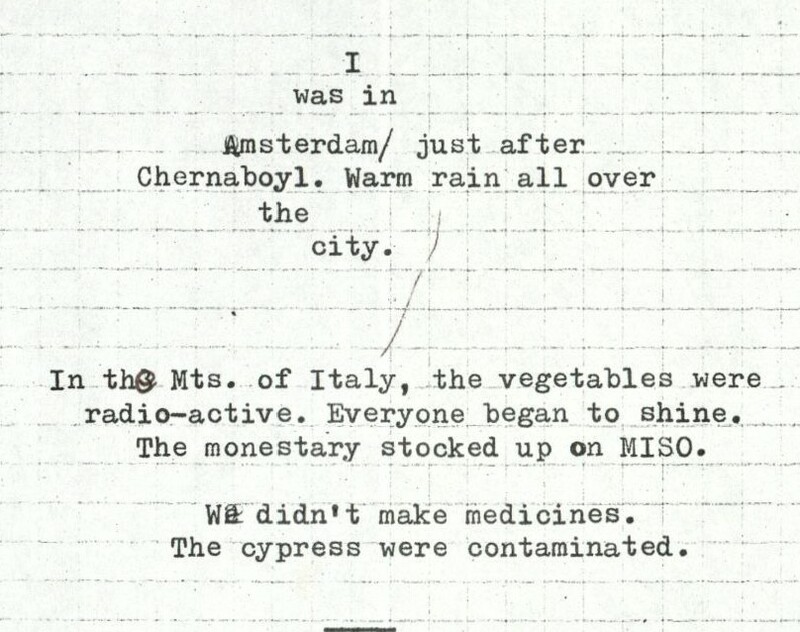 Below is part of a poem by Louise Landes Levi, writing about the Chernobyl nuclear accident of 1986. Special Collections is delighted to add this collection to our literary holdings, which include the papers of Hayden Carruth, David Budbill, James Hayford, Sarah Cleghorn, and Dorothy Canfield Fisher. More information about the Longhouse Records is available in the collection finding aid. This entry was posted in Manuscript Collection and tagged Bob Arnold, Cid Corman, Guilford VT, Longhouse Publishers and Booksellers, Louise Landes Levi. Bookmark the permalink.